When I first took these out of the oven - and at first nibble - they're pretty good! ..
Dosai is a pancake-like South Indian dish. ..
Indian Chutney, an accompaniment to lots of South Indian dishes & snacks. Experiment with the proportions, that's the best way to learn with Indian recipes. 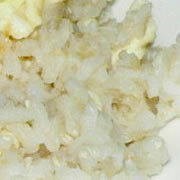 ..
Super quick, and considerably healthier egg fried rice to accompany a range of oriental vegetarian recipes. .. This is fantastic with salads. If you wish you can add some dandelion petals. It needs to be used the same day due to the egg yolk. ..